Sea Eagle 330 with Deluxe/Pro Package 2017 Review | Kayakandcanoe..
What would be better than an easy carrying and lightweight kayak like Sea Eagle 330 Inflatable Kayak with Deluxe Package for beginners? Imagine yourself blasting down in rivers with a boat or kayak, spray flying everywhere and your heart bit raised in the sky. Most of the people imagine about kayaking this way. However, there is another side of this image, like kayaking on a mirror-smooth lake at down slicing the silence with the smooth paddling. Moreover, all these imaginations could be possible with a flexible yet easy to use, and easy to carry kayak that can go with every type of waters and weathers. 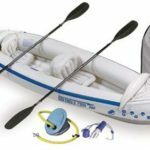 The Sea Eagle 330 Inflatable Kayak with Deluxe Package just what I have explained above it can carry two adult people, but only one adult is enough to carry it in the water. It has lots of space for carry all your necessary things. However, it is easy to inflate and has removable seat option. This kayak can handle up to class here whitewater and can survive from any rough surface. It is quite fast in speed and allows smooth paddling. Overall, it could be the best inflatable kayak for all the beginners even others who loves kayaking. Made with K-80 polykrylar hull martial. Room for lots of goods with the double inflatable seats. Nine inch I-beam construction and high frequency welded seams. Three inflatable chambers in starboard, port, and floor. Two skegs on the bottom for better speed. Beautiful design with white and blue color combination. You can use the Sea Eagle 330 also as a paddled canoe rather than using it a sports inflatable kayak. Virtually this kayak is impossible to tip or sink. So if you are a new in kayaking than this inflatable kayak could be an ideal model to use. Since it is very easy to turn; maneuver and can go through over almost anything sharp and pointy. Even this best fishing kayak is quite easy to setup. Anyone from any age can carry it or inflate or deflate it easily. It’s self-bailing drain valve allows you to let the excess water out immediately easily. However, you can take it anywhere you wish in your car, RV, boat, bike, etc. just deflate the kayak and fold its properly, now it is ready to keep it on bag and travel with all around the world. You can explore the new edges of water life; can go for fishing with this kayak or else for the calming and relaxing on the lake, river and near the sea. Is it great for Beginners and Traveling? If you are a beginner looking for a suitable budget friendly inflatable kayak that good for traveling than you will surely enjoy this one. Kayak with higher ends will last longer compression to others. They are much robust and practically tough to get punctured. Moreover, they are flexible to use any weather or water. So you can often use them different kind of locations all round the year. Many of us used to kayaking just a few times in the year and rest of the time these kayaks find themselves locked in the storage or garage. If you are also in this group, then a durable and good quality kayak like the Sea-eagle 330 would be most appropriate for you. Besides, this kayak is great in fast performance, means it is able to track in faster speeds. Once you get better in paddling, you will fully gear up the kayak to reach higher speeds. So overall, beginners will find the kayak more flexible to use in different ways yet enjoyable. It is easy to use, paddle, suits all condition and easy to store or transport anywhere. Moreover, once they skilled enough, they could upgrade to one of its other models. The kayak is perfect for individual purposes like floating in calm water lake or streams. It is fit for two adult person and perfect for any outing comfortably. Two seats of the kayak are quite comfortable in a long time sitting. Inflation and deflation process is very easy and quite fast. It only takes 10 minutes to put together and take apart. The martial of this product is unyielding, so you are out of tension about ripping, tearing unless anyone is trying to cut it with sharp knife or scissors or your dogs trying to tear it off with his sharp teeth. The boat is much heavier than mentioned. The backrests are not so supportive that it should be. Q: I have a terrier dog, and I like to fish with him in my kayak, is there any possibility that his toenail can puncture the surface of the kayak? A: No, the kayak is adamant, so toenail would not be a problem. Q: Do I adjust the seat location for single kayaking? A: You can move the seat, and one person can handle its perfect. Q: Do the backrests are supportive enough for long tours? Q: Does the kayak come with any warranty? A: Yes, it comes with three years of warranty service. 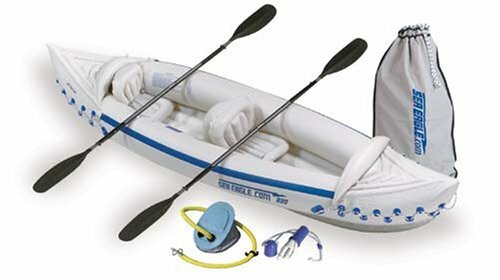 Most of the deluxe inflatable boat or kayak comes with lots of option including with a high price tag. However, this one is fit for all by sides. 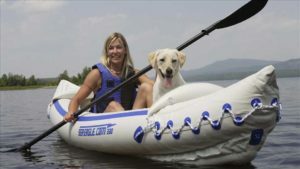 With all the super useful features it allows you are kayaking with another companion. So those who are new or want to have something light and comfortable for kayaking could find this product really useful. So, what are you waiting for, put on your life jacket and grab the paddle? If you found a companion than its fine, otherwise, go alone in and enjoy the flash of water and discover a new world with the Sea Eagle 330 Inflatable Kayak.